On March 14th (Or 3.14 to all the American readers) every year, Mathematicians take some time away from their high paced, all action lives to celebrate Mathematics and the wonder that is Pi. And what better day of the year to try and encourage any budding Maths lovers to pursue their passion into University. 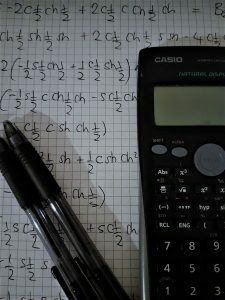 For the majority of us, Maths was that subject at school that you tolerated but never really loved. But frankly, it’s our first meaningful relationship. When we first meet, we bond over addition and subtraction, and even try to impress Maths by memorising times tables. And as we grow older, so our knowledge and understanding of Maths intensifies. Then our first real bump in the road. Algebra. All the numbers that we loved get replaced by symbols and letters, and you wonder where everything went wrong. Some of us part ways here, but the believers amongst us accept the changes that Maths has made. So if you’re thinking about studying Maths at University, and especially at Leicester, the department here really encourage you to develop your interest in the subject and provide the guidance and teaching to consider the various possibilities that a degree in Maths can have. So why not keep the relationship going!